My jaw dropped when I saw this cake (actually, it’s a torte) on the Every Cake You Bake blog. How much more perfect could a cake get? Agnieszka, the lovely Polish baker and blogger, was kind enough to let me share this noteworthy recipe with you. I truly wish I could fly to Poland tomorrow just to have a slice! 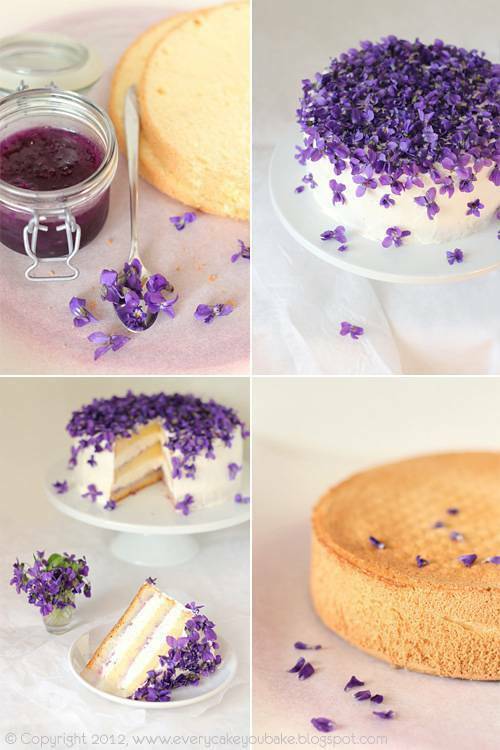 Agnieszka’s blog is full of brilliant ideas (including the violet jam that goes with this recipe) so be sure to check it out and don’t let the fact that it’s in Polish keep you away. The photos alone are worth it. 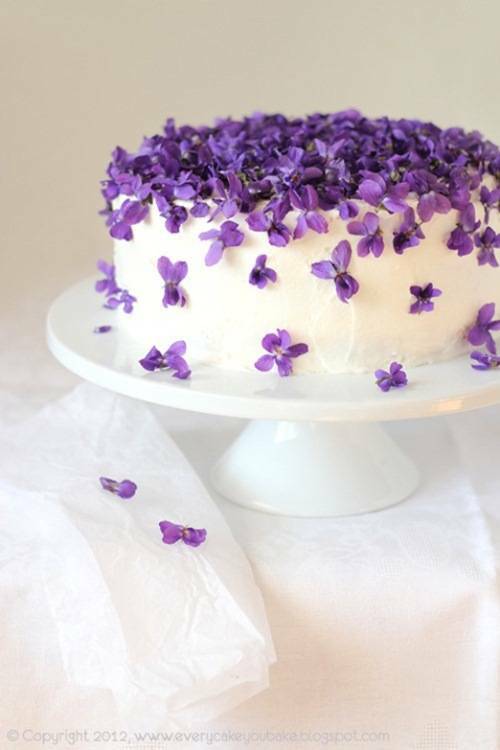 So, if you can get your hands on enough violets this cake should be on your to-make list. I’d love to see this as a multi-layered spring wedding cake! Separate egg yolks from the egg whites. Whip egg whites and salt until light and foamy, and add powdered sugar mix with vanilla sugar. When the foam is stiff, add one egg at low speed on your mixer. Mix and sift flour, then add the egg and gently stir with a spoon or spatula. Finally, add the melted and cooled butter and mix gently again. Preheat the oven to 350 degrees (170 degrees Celsius). Line the bottom of the 8″ pan with butter and fill with batter. Bake about 30 minutes, until dough is elastic, and a toothpick stuck in the middle is dry. Remove the baked sponge cake and set on cooling rack. 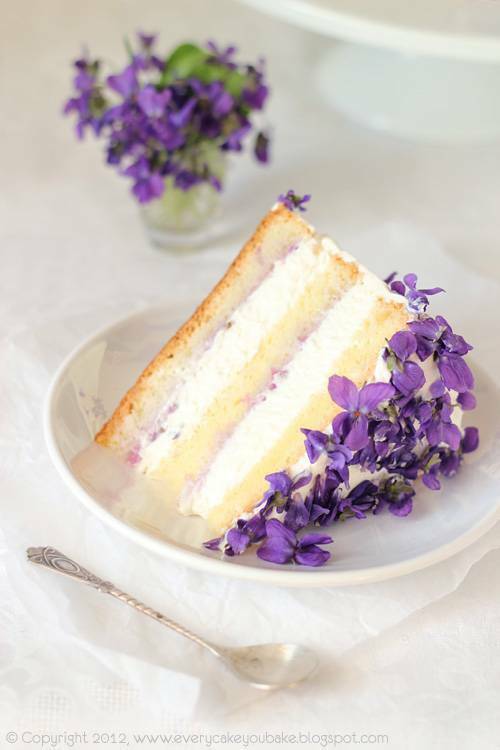 Whip the chilled cream with powdered sugar in the cream (you can add more sugar according to taste, but the cream should be light in flavor, not to overpower the taste and smell of the violets). 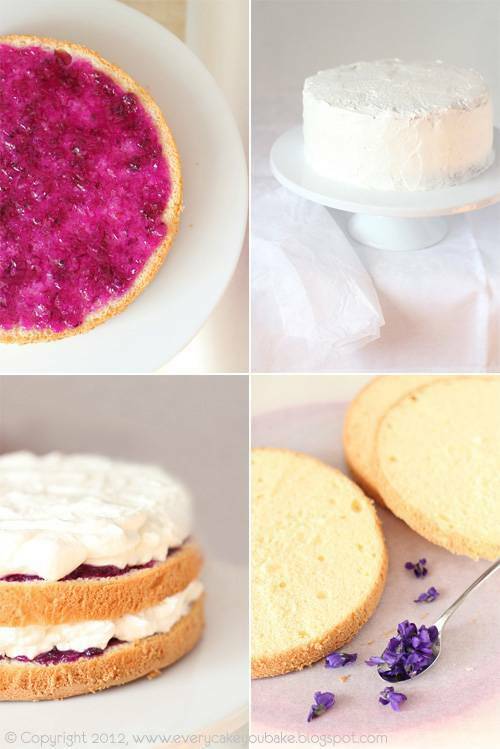 Cut the sponge cake horizontally into three slices. Soak each disc with a few spoonfuls of boiled water mixed with vanilla sugar and lemon juice, because there is nothing worse than dry cake! On the lower deck use 2-3 tablespoons of sponge cake spread with violet jam and 1/3 of the whipped cream. Cover the top and on the middle layer spread jam first, then 1/3 of whipped cream. Cover with the last layer, then cover the top and sides of the cake with the remaining cream and cool. Before serving, sprinkle with violets. *Translated from Polish with Google, and a little bit of my own detective work. Is it possible to be in love with a cake? If so, then my heart is lost to this one.